Green With It had the most liked content! Im alive again ya wierdos. We're weird still, ya aliveo. Man, being weird is better than being alive! No! No weird zombies, please. I think i'm addicted to Mike n' Ikes. Did I ever mention that I despise Algebra II? I seem to switch projects a lot. Would any of you consider this normal? Kinda. It's good have a lot of original ideas, but at some point you have to buckle down and decide to stick with one until completion. Otherwise, you'll probably just end up with a bunch of half finished projects. I've spent months on projects and then killed them before they even took off the ground. I don't think it's too uncommon to switch around. I got my college acceptance letter! Now i can get my degree in 3D Design! Congratz! 3D design is a lot of work, but super fun. Im not dead, the doctors just put my brain into a mobile phone for the a bit. Sorry for being absent lately i have been busy with school and grades. Are you all edumacated now? Since im afraid of using my laptop for rpg work right now, I decide to write a short story that combines an idea that ties in with my game's story. Ill probably post it as a blog post. But why are you afraid? I feel pretty dumb right now, I got a new PC tower for christmas with it all in there. It came with discs and I thought i needed to install stuff I just read the disc and it has in BOLD letters, "THIS IS A BACKUP THE STUFF IS INSTALLED ALREADY"
I feel your pain, specially when it's about Microsoft Edge and it's great tab restoring feature. Since i've joined this amazing community I have received a lot of advice and tips regarding how a dungeon should be made, and such. I've also received a lot of support from you guys here as well as a small circle of people who I discuss this project with. Non the less i'm not here to list all the praise I am getting, i'm here to discuss the direction my game is taking as of January 2016- Present. (2017) I would like to start of and give a percentage of where i'm at so far. I am around 8% done with my game so far. This percent seems pretty tiny to most people who might read this, but ironically this is the hardest amount of effort I have EVER put into a project let alone a possible commercial game. What have I done since last year exactly? 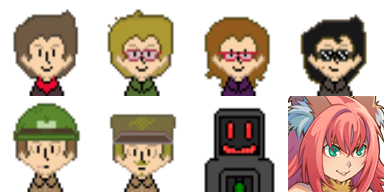 Well, to start I have made my main Protagonists a lot more likable and given them personality. Compared to early 2015 or late 2014 these characters i made are more relatable and also fit the era they live in, (ex. 1950-1960) Also I made the locations in the game more simplified and constrained most of the towns into one country (america) but also gave some locales to places like the pacific isles, and even the Soviet Union. Whats the plot synopsis on your game GWIT? Below are some screenshots of the game so far. Got two towns completed under my belt and barely broke 10 maps so far, the down side is that I have to make tow dungeons and then it might get big with the maps. Now for Forests! Mine usually end up being mazes for some reason. You could even go all Lost Woods w/ it. Climbing trees to get stuff/access other areas works. Or narow trails w/ hidden paths sprinkled in. Buring away/chopping vines or giant flowers in your way. If there a river/lake, you can make a little puzzle to cross. Pushing logs or blowing lily pads. Jumping across rocks (if you have an auto-jump). You can do it w/out auto-jump, but it makes more sense. that sounds like a really good idea ill give that a shot! My resolution this year is to get my RPG maker project completed. hope this will be a good year for us to finish our game.